So with that said, I decided to make another notebook. I figured I would designate this notebook to only stay in my purse and use on the go. I included a pocket for business cards that is so much easier to whip out than scrambling through my wallet for one. I love how the design is so simple and it’s also unisex. It would be a great gift for any creative type or list maker. Also, I realized a passport fits perfectly in it, so it would be great for traveling. Start by placing the journal on one corner of the piece of leather leaving a quarter of an inch on each side of the journal. Measure and Mark a quarter of an inch at the top of the journal. These will be your cut lines. Do the same on the other corner of the piece of leather and using your metal straight edge line up your marks and cut with your Xacto knife. Estimate how much space you’ll need for the journal and pen to fit. My overall measurements are about 8 ½ x 6 inches. Mark and cut. Next take some of the leftover leather that is 6 inches in width and measure out your pockets. Measure and cut two pockets that are the same size. Each pocket should be about 6 x 3 inches. To add a little pocket for business cards, position your card where you want it to go. Measure out and cut 2 inches X 2 1/2 inches. Line the two sides and bottom of the little pocket with super glue, leaving the top part unsealed. Next Grab some needle and thread and stitch along the sides and bottom of the pocket for a finished look. 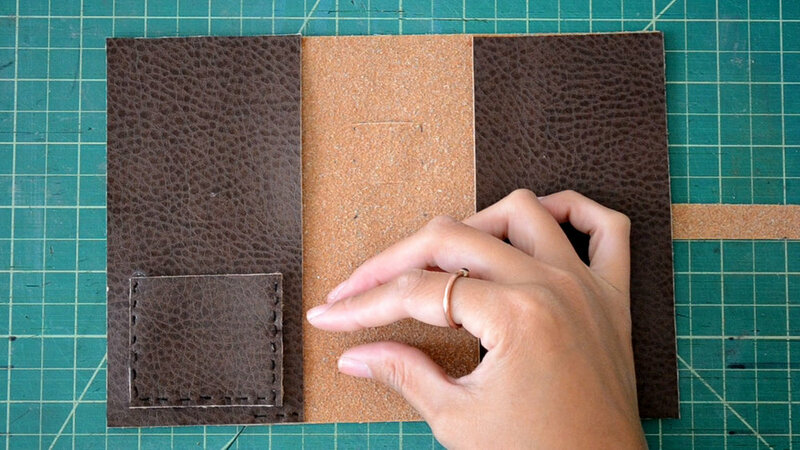 Cut a little strip of leather and place it on the back of the cover sewing an X stitch and repeat a few times. Knot it at the end and cut excess thread. Mark cut lines for the slits your strap will go through. Open up the cover and cut your slits. Do the same thing for your pen. Measure out where you want your slits and cut. Super Glue the edges of the pockets leaving the insides open. Stitch along the edges to seal. Your little journal carries your notebook, pen, business cards and even your phone. It’s the perfect size to throw in your purse and is ready whenever you need to jot any little thing down. Watch the full video here. Let me know what you think.